This is a quick and easy granola recipe that doesn’t have a mile-long list of ingredients. The original recipe calls for dried cherries, which is very good, but we usually put in dried blueberries instead. Pour some over yogurt and you have a great breakfast or snack. Adapted from an Ina Garten recipe. 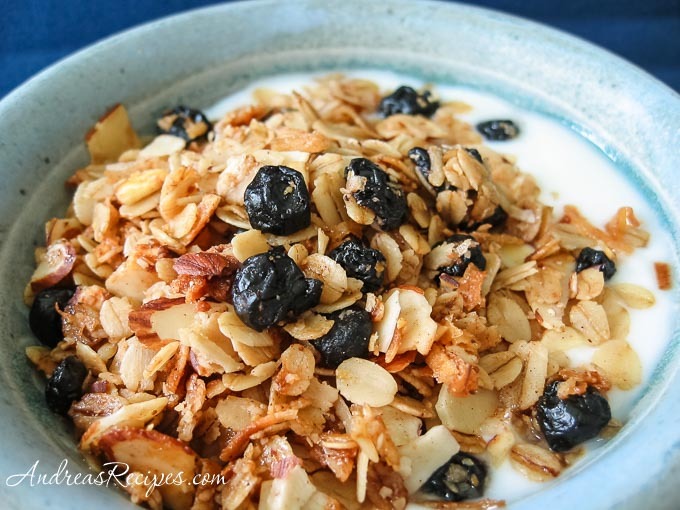 Toss the oats, coconut, almonds, and blueberries together in a large bowl. Pour the vegetable oil and honey over the oat mixture and add the cinnamon. Stir with the silicone spatula or spoon until the mixture is completely coated. Pour onto the prepared baking pan. Bake, stirring about every 5 minutes with the spatula, until the mixture turns a nice, even golden brown, about 25 to 30 minutes. Remove from the oven and allow to cool, stirring occasionally. Store cooled granola in an airtight container.